With biblatex, is it possible to replace one author of an author list by a bibnamedash or idem string? I assume that it should be possible by customising \DeclareNameFormat, but I don’t know how. I should have added that there was a feature request for biber which pointed back to biblatex. See this feature request. Is this somehow possible now with biblatex 1.4/1.5? I played a bit with uniquename/uniquelist, but I could not get it to work. The leading names in the current author/editor could be compared with the previous bibliography entry's author/editor using internal lists from etoolbox. These lists can be built up with \indexnames. 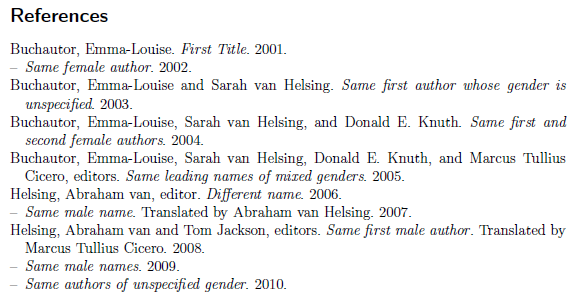 Some counters and tracking of the last entry's gender field help ensure that the names are properly delimited and use of the appropriate idem bibliography string. For simplicity I've assumed no truncation of author/editor. It is possible to permit truncation. However the resulting style would be rather ambiguous; recurrent andothers read identically, but could refer to different authors/editors. The solution could definitely be made more efficient, probably with the use of a routine that drops a specified number of elements from the end of a given list. It could also make smarter use of information available in the gender field, either from entries before just the last one or from the current entry. AFAIK this is not possible yet. The is a limitation of the traditional bibtex format. You cannot really handle individual persons in the author field (the same problem rears its ugly head when it comes to things as name prefixes or gender which can't be set for one author if there are several persons in the author field). I know that this will be improved in later biber versions (the TODO says version 1.3). EDIT: I'm also not sure if this behaviour in your case is really desirable. As long as the style doesn't demand it I wouldn't do that. After all, the dash is meant to indicate that the authorship is identical, but if there are several authors, the authorship has changed.